Snowden Racing :: McLaren's all revved up on debut! McLaren's all revved up on debut! 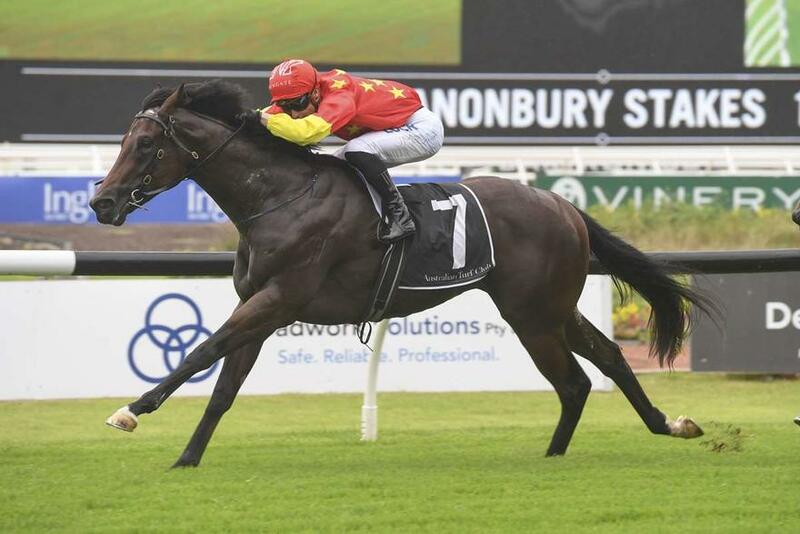 McLaren race cars have big motors and two-year-old namesake, McLaren, trained by the Snowden’s just might have one as well after the colt won his first start in the $160,000, Group 3 Canonbury Stakes (1100m) at Rosehill on Saturday. Punters were sure that the motor existed after a near 7L trial win over 797m at Warwick Farm on January 22nd backing the Exceed And Excel colt from $1.85 into $1.55. However, if they had been watching the preliminary they might not have been so sure with McLaren needing two handlers and sweating throughout the time in the parade ring. Once on the track those concerns vanished with McLaren breaking well under James McDonald and settling behind Exceed The Stars and Tim Clark who led at speed to the top straight. Passing the 400m McDonald sent McLaren up to challenge, which the colt did with ease, and then McDonald waited. At the 250m McDonald slipped McLaren up another gear and it was swiftly into place and that was the winning of the race. Spring Loaded (Redoute’s Choice) and Tommy Berry came hard down the middle of the track but it was to late and they were looking at McLaren’s exhaust pipes with the margin 3/4L at the line. Deep Chill (Wandijna) and Glyn Schofield came from the rear to take third on the line, the margin 1 3/4L.Exceed The Stars was fourth. The time was 1.05.98 on the Soft 7 track with the final 600m in 35.01. “It was good to get that done, there is a lot of room for improvement there. He did a few things you do not want to see them do. Look he has got talent, I am being really picky but you have to be at this level, and hopefully there are a few things we can improve on,” said Peter Snowden. “What I did like is that he began well, he was going to get going keenly and he had to back off and I am glad James gave him the time to do that, and he did that really well so that is a big plus. There are a few other things he has to get right, but he is only young and it was his first start and you cannot do any more than win and he has done that well today. “What we do from now on will all depend on the horse and how he comes through the run. He is not a gross horse, but looking at him he might need more of this to get him settle and relaxed a bit more. “But he is an exciting colt, what he does at home is really, really good. Up until the trial the other day we had not clicked him up, but it is clear to see what he has. He just has to learn to harness everything and save it for when you need it,” he said. “He has always been a bit of a hyperactive kind of horse, but the best thing about him you put him out there on the track is that he knows what he is there for. He has been very well educated,” said McDonald. “He has that much speed he just does not know how to harness it yet , it is an exciting thing that once he does learn to harness it he is going to be a very good horse. It is all raw ability at the moment, but I think he is going to go the whole way. “It worked out really well. I had a funny feeling that they would go forward so he had to learn to settle and he did that really good, albeit that it took him a furlong (200m) to come back. “I love his acceleration , he has a great will to win, he is a real racehorse and it will take him a long way,” he said. 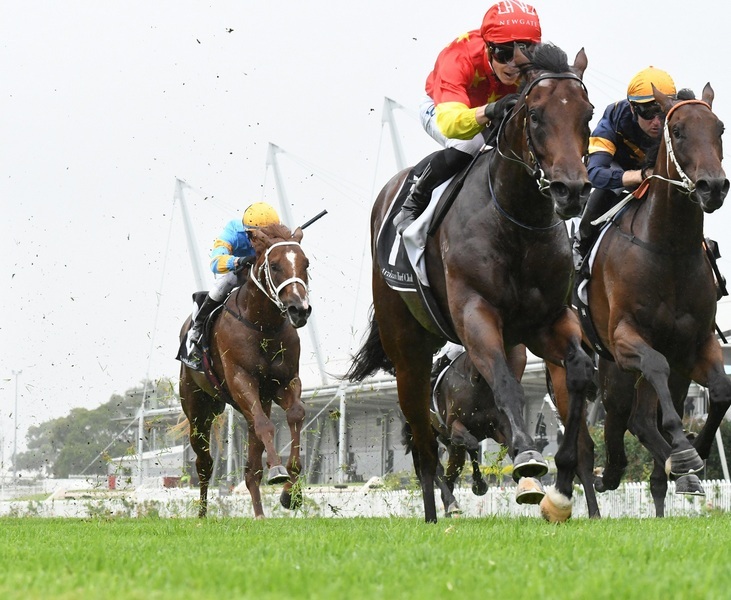 McLaren, out of the Encosta de Lago mare Serenada, firmed from $15.00 earlier Saturday into $11.00 for the Group 1 Longines Golden Slipper (1200m) at Rosehill on March 23rd. Saturday’s win earned a stake of $84,000 for owners Newgate S F, China Horse Club Racing Pty Ltd, Matthew Sandblom’s Horse Ventures, Winstar Farm Llc, Henry Field Bloodstock and Mrs TL Vogel’s G1G Racing & Breeding.